Fear and the Ruptured State: Reflections on Egypt after Mubarak by Talal Asad. The journal is edited and published by the New School for Social Research. The authors in this issue attempt to illuminate the history behind the Tahrir Square uprisings and the events that followed. Though the situation is very much in flux, I think that together these articles provide the reader with a way to understand what happened and what may happen in Egypt. All revolutionary situations are characterized by fear – and fearlessness. All tend to generate widespread suspicion. This is as true of the Egyptian uprising as of other revolutions. But fear and its opposite are not singular emotions. This article attempts to describe the different modalities of “fear” that have played a central part in Egyptian politics since Mubarak: fear of failure to achieve full democracy, fear of instability in everyday life, and fear that the revolution will be betrayed by the generals and the Islamists. A major theme in the unfolding events is the fear that national solidarity will be torn apart by sectarian conflict inflamed by reaction. This article takes up at length the question of secularism in the Egyptian context, and ends with an analysis of religious discourse employed publicly by a prodemocracy activist to urge fearlessness toward the repressive state. There are 45 million young Egyptians who are under 35 years of age (including the largest group of adolescents in the country’s history). More than a million Egyptian postgraduates now live in Europe and the United States; the vast majority will most likely never go back to live in Egypt—and increasingly have very tenuous links to their original country. The millions of young Egyptians entering the country’s public life needed to reestablish these links in order to make sense of their lives and their society. With political participation at a dismal low, they turned to other outlets, with thousands expressing their dynamism and activism as writers, filmmakers, singers, and musicians; through a wave of innovation in Egypt’s business and finance scene; and in philanthropy and social investment. While most of this activity does not touch the vast majority of young Egyptians, whose main concerns are surviving in daily life, finding work and social opportunities, and acquiring skills, there were some positive trends: a shift from whether to how the private sector and its agents will transform their economic power into political power; a revival in the role of (and respect for) civil society; liberal sparks in music, films, and literature, and in attitudes, styles of living, and tastes; and, most important, the exposure to the world of millions of youth from disadvantaged backgrounds in ways that expand their aspirations and ambitions. There is a chance that the new dynamism that Egyptian society is currently experiencing, after the turbulent times of the past 60 years and especially with the momentum that the 2011 uprising gave rise to, will bring about development and progress phases that Egyptian society has not yet undergone. But the same interactions and dynamics could prove to be false promises. The detachment of the majority of young Egyptians, amid crushing living conditions and the disenchantment with the uncertainties and disruptions that have accompanied Egypt’s new political landscape, could rouse a tornado of turmoil in which chaos trumps hope. The largest Arab country, with a political life that has a broad pan-Arab resonance, Egypt saw between 2 and 4 million of its workers participate in some 3,400 to 4,000 strikes and other collective actions from 1998 to 2010, a movement sustained with no support from the state-sponsored Egyptian Trade Union Federation. Their movement provided numerous occasions for exercises in participatory democracy. When workers did begin to speak about politics, they did not limit themselves to formal democracy—free parliamentary elections and the rotation of power. They demanded substantive democracy: free trade unions and distributive social justice. These understandings of democracy were rarely articulated as a comprehensive political program by a recognized national leadership. Compiling an exhaustive representative list of the root causes of the Egyptian January 25th revolution, is a daunting and challenging task. Egypt’s historical richness and depth, its demographic complexities, multiple and upon occasion conflicting identities, its geo-political characteristics, the length of President Mubarak’s three decades’ rule, and the successive layers of policies and discursive fragmentations through the various phases of his rule, are but a few factors at play – enough to challenge any analyst. There is no doubt that any attempt to begin to understand what motivated millions into Egypt’s streets for 18 days after decades of relative submissiveness, will indeed require a deep analytical deconstruction of Mubarak’s corpus of policies in 30 years. The following analysis aims to scratch the surface and delve into some of the key root causes for the uprising, addressing each separately and as interwoven points of latent resistance, culminating in Mubarak’s ousting. It is meant to be a broad perspective rather than an in-depth study; a ground work for a more extensive subsequent endeavour. Moreover, the current “fluid” state of affairs after more than a year since the cataclysmic eruption of anger and resistance in Egypt, adds further difficulties to uncovering the root causes of the Revolution. This is partly due to the growing, yet legitimately valid possibility, that the Egyptian Revolution is still “work in progress” and far from “a done deal.” Such a perspective leaves the Revolution with open vistas in terms of fulfilling its goals. This is especially the case as potential new and emerging causes seem to be feeding into a turbulent situation of escalating discontent that carries the potential of a second round of a massive revolt (Darwish: 2012). Contextually, this perspective limits itself to a more manageable and contained timeline, up to the point of the uprising’s initial success in toppling the former Egyptian President on February 11th, 2011. It is my hope that some of the insights offered in this context, will shed lights on later developments that did and are still taking place on the ground. Films produced in Egypt in the period between 1992 and 2010—that is, in the period just before the revolution of January 25, 2011—construct an “imagined society” that contains within itself aspects of both unity and fragmentation. In these works of art, unity is generally expressed in terms of the nation and the family, as well as in terms of an assumed collaboration among different classes. Disunity is generally portrayed as a consequence of injustice against low-income groups and women. These films are representations in the service of ideological positions constituted within a discourse on the social good. The film producers are themselves members of an urban elite. They speak on behalf of the entire society but draw upon their own feelings; among these are feelings of anxiety, mistrust, and fear. These filmic representations need to be critically examined in the context of diverse lived experiences, and thus as enabling an uprising that was itself a result of many factors. This paper closely studies the 18 days of the revolution in Egypt as well as the post-revolutionary transition and examines the role of the army in this period. A central question the paper attempts to answer is how to explain the apparent paradox about how the Egyptian military lent pivotal support to the protestors during the revolution itself, but now, in its administrative role during the transitional period, seems so reluctant if not actively resistant to allowing actual democratic change, to the extent of using excessive repressive measures. I argue that a set of complex and contradictory economic, social, historical/cultural and international geopolitical factors pressured the army to take the stance of siding with the revolution at the time of the revolt. I suggest that the army leaders sided with the revolution only to establish a form of democracy that retains the interests and the economic empire of the army. I then analyze different explanations for the excessive repressive measurements the army leaders have taken against peaceful protests and calls for more comprehensive democratic reform. And I argue that all these explanations are valid, but should be understood in the larger problem of the revolution’s challenge to the military rule in Egypt that has been in place since 1952. 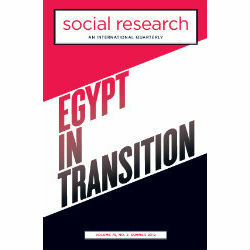 The paper is based on: (1) an ethnographic work conducted in Cairo from February 4, 2011 to April 15, 2011; (2) 60 interviews with Egyptian activists, 50 of them randomly selected from different groups during the revolution, made in person, and 10 selected interviews with activists during the transitional period, the latter conducted by phone; and (3) archival work, especially on op-eds written by Egyptian intellectuals before and after the revolution in Egyptian newspapers. The paper contributes to literature on the sociology of revolutions and post-revolutionary transition. The organizers of the protests in Egypt on January 25, 2011—”Police Day,” a public holiday that commemorates the role of the police in the resistance against the British occupation in Egypt—wanted to subvert the celebration of the police and turn the day into an occasion to indict the institution in charge of policing—in a sense, putting it on public trial. To grasp the character of the police in Egypt, we need to consider the police not only as an organization in charge of public security, but as an agency of government in the broad sense. At the heart of police government of the social lie practices of surveillance and discipline of the body and the affect. I contend that the people’s rising during the revolution was directed at the terms of police government through the affect. In putting forward this proposition, I highlight the role that physical punishment and verbal violence play in the disciplining of bodies and minds. Drawing on my fieldwork in Cairo’s new popular quarters— conventionally referred to as “informal quarters”—and in informal markets, I will sketch out the patterns of interaction with the police and the structure of feelings toward the government of the police that developed in the processes of interaction. In this structure of feelings (or affective register), a sense of humiliation and of being humiliated is deeply felt by ordinary Egyptians. The experience of being humiliated in encounters with the police underpins affective dispositions such as anger, disdain, and revulsion toward the police. I propose to look, first, at key human rights indicators on the eve of the uprising. Second, I will review the main human rights developments, positive and negative, under the military commanders who took over from Mubarak and developments so far among the main political actors. Lastly, I will discuss the main concerns in areas such as writing a new constitution, security sector reform, and preserving and expanding space for non-violent political competition moving ahead. In the aftermath of the overthrow of President Hosni Mubarak in February 2011, the Supreme Council of the Armed Forces (SCAF), headed by Field Marshall Hussein Tantawi, became a sort of collective presidency in Egypt that appointed interim prime ministers and shepherded the political process toward parliamentary elections in the fall of 2011 and presidential elections in 2012. Egypt’s revolutionary youth movements attempted to push back against this military role, to pressure the SCAF to try Mubarak and his cronies and to give up emergency law and military tribunals for civilians. Youth movements such as April 6 took the lead in pushing for the subjection of the officer corps to civilian rule. Their demonstrations and slogans were met with repression. How did the conflict between what has become known as the New Left youth and the old generals shape the debate about the new Egypt in the 15 months after the revolution? This paper is an analysis of the Coptic Church opposing attitude to the Egyptian revolution. By tracing the shift that happened during Pope Shenouda’s era (1971-2012), by which the church adapted new class policies that represent the clergy and the Coptic elite’s interests. On the other hand the majority of Copts were completely ignored. That is why the Coptic church is fighting to keep its gains. In this essay I shall give a brief account of prerevolution religion-state relations before examining two important and prominent actors exemplifying these trends: the first generally seen as a social actor, the Muslim Brotherhood; and the second generally seen as a state actor, al-Azhar. Mack, Arien. 2012. Editor’s Introduction. Social Research 79(2): xvii – xviii. Asad, Talal. 2012. Fear and the Ruptured State: Reflections on Egypt after Mubarak. Social Research 79(2): 271 – 298. Beinin, Joel. 2012. Egyptian Workers and January 25th: A Social Movement in Historical Context. Social Research 79(2): 323 – 348. Osman, Tarek. 2012. Young Egyptians: Their Society and Their Future. Social Research 79(2): 299-322. Stork, Joe. 2012. Egypt: Human Rights in Transition. Social Research 79(2): 463 – 486. Cole, Juan. 2012. Egypt’s New Left versus the Military Junta. Social Research 79(2): 487 – 510. Brown, Nathan J. 2012. Contention in Religion and State in Postrevolutionary Egypt. Social Research 79(2): 531 – 550.